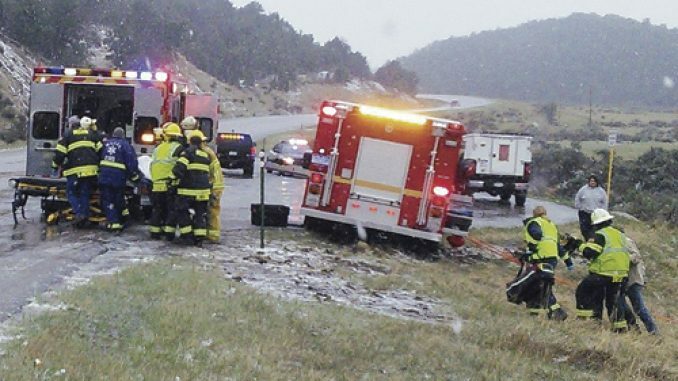 On Friday afternoon, about 5 miles south of Meeker on Highway 13, Andrew Lawrence, 24, of Meeker and his 24-year-old wife, Brittany Walsh, who was driving in slushy and wet roads, drove off Highway 13, rolling to a stop at the bottom of a steep ravine. Lawrence was unhurt, but Walsh was trapped in the SUV and had to be extricated. She was taken to Meeker’s Pioneers Medical Center then airlifted to St. Mary’s Hospital in Grand Junction. Walsh, in her eighth month of pregnancy, gave birth to Scarlett Rose Lawrence, who weighed 5 pounds and 10 ounces. Mother and daughter are reported to be doing fine and are in good shape. Above, Walsh is loaded into the ambulance at the accident scene by Meeker EMTs. 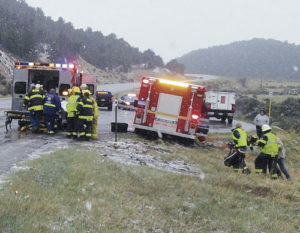 MEEKER I On Friday at about 3 p.m., a rainy and slushy spring storm asserted itself, allegedly causing a medium-sized SUV to leave the road and roll over into a deep ravine on the side of Highway 13, just south of Meeker. Of the two occupants, a pregnant woman was trapped in the vehicle. Occurring near mile marker 37 across the road from the Meeker Sportsman’s Club, the vehicle came to a rest upright about 60 feet down the steep embankment. The ravine was so deep, in fact, that the vehicle was not readily visible from the highway. The passenger, 24-year-old Andrew Lawrence of Meeker, was able to exit the vehicle and call in the accident. The driver, Lawrence’s 24-year-old wife, Brittany Walsh, was trapped and had to be removed by Meeker Rescue 1, which arrived on the scene quickly. Among those first responders were Steve Allen, Vaughn Moody, Michael North and Laura Smith. Personnel from Fire Engine 525 also aided at the scene, as well as Patrol Lt. Glenn Wilson of the Rio Blanco County Sheriff’s Office. Lawrence was not injured, but, because of her pregnancy, Walsh was rushed to Pioneers Medical Center and later transferred to the obstetrics/gynecology unit at Saint Mary’s Hospital in Grand Junction. While the posted speed limit is 65, Dibenedetto stressed that road conditions must be factored in. Walsh told the Herald Times on Monday that she could not remember whether she actually lost consciousness as a result of the accident. “I remember hydroplaning and counter steering, and that’s it,” she said. Mother Brittany is doing well as is baby daughter Scarlett Rose Lawrence, who entered the world at 5 pounds, 10 ounces and at 17 and one half inches in length. “We all feel incredibly lucky,” Walsh said. MEEKER I Excessive speed was not a factor in the Nov. 19 single-vehicle rollover accident that injured five Meeker-area teenagers and young adults just west of Meeker. RBC I According to the Colorado Department of Transportation, traffic on Colorado Highway 13 between Craig and Meeker will be affected through October by construction work.